^ d' Espagnac: Histoire, p. 329. ^ Browning. 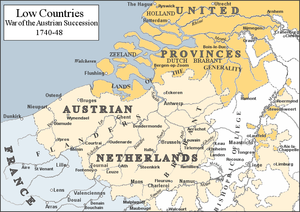 Austrian Succession, pp.317-319. ^ 『ザ・ジェントルマンズ・マガジン（英語版）』, Vol. 17, London, 1747. pp. 328-329, 401-402, 409-412, 464-465. Cust: Annals, V.II, p. 121, 「全ヨーロッパが注目する、ベルヘン・オプ・ゾームの命運は……」. ^ Cust: Annals, V.II, p. 121. ^ Browning: Austrian Succession, p. 321. ^ d' Espagnac, Jean-Baptiste-Joseph Damarzit de Sahuguet. Histoire de Maurice, comte de Saxe, duc de Courlande et de Semigalle, Vol. 2, Paris, MDCCLXXV. p.283. ^ Wittje, G.. Die wichtigsten Schlachten, Belagerungen und verschanzten Lager vom Jahre 1708 bis 1855. Leipzig und Heidelberg, 1861. pp. 270 to 275. ^ Browning: Austrian Succession, p. 319. ^ Wittje, G.. Die wichtigsten Schlachten, Belagerungen und verschanzten Lager vom Jahre 1708 bis 1855. Leipzig und Heidelberg, 1861, pp. 270 to 275. ^ Browne, James, A history of the Highlands and of the Highland clans, Volume 4, Glasgow, 1840, p.241. ^ The Gentleman's Magazine, Vol. 17, 1747, London, p.410. ^ SHAT,A4 86 envoi Wagner, piece 9c -Copie des archive de la Haye. ^ d' Espagnac: Histoire, p. 327. ^ Skrine, p.337. Also, Browning: Austrian Succession, p.320. ^ Cust: Annals, p. 122. ^ Browning: Austrian Succession, p.329. Also, Simms: Three Victories, p. 350. Browne, James. A history of the Highlands and of the Highland clans, Vol. 4, Glasgow, 1840. Browning, Reed. The War of the Austrian Succession. St. Martin's Griffin, 2008, ISBN 0-312-12561-5. Lodge, Sir Richard. Studies in Eighteenth Century diplomacy 1740–48. John Murray, 1930. Rodger, N.A.M. The Insatiable Earl: A Life of John Montagu, Fourth Earl of Sandwich, 1718–1792. Harper Collins, 1993, ISBN 0-393-03587-5. Simms, Brendan. Three Victories and a Defeat: The Rise and Fall of the First British Empire. Penguin Books, 2008, ISBN 0-465-01332-5. フランシス・ヘンリー・スクライン（英語版）. Fontenoy and Great Britain's Share in the War of the Austrian Succession 1741–48. London, Edinburgh, 1906. An authentick and accurate journal of the siege of Bergen-op-Zoom by an English Volunteer. London, 1747. 『ザ・ジェントルマンズ・マガジン（英語版）』, Vol. 17, September, 1747. London, 1747.
d' Espagnac, Jean-Baptiste-Joseph Damarzit de Sahuguet. Histoire de Maurice, comte de Saxe, duc de Courlande et de Semigalle, Volume 2, Paris, MDCCLXXV. Wittje, G.. Die wichtigsten Schlachten, Belagerungen und verschanzten Lager vom Jahre 1708 bis 1855. Leipzig und Heidelberg, 1861.